The NFL Season is now down to only four teams who are all hungry for Super Bowl rings. This coming weekend, two more teams will end the season just a win shy of making a trip to Super Bowl XLV in Arlington, TX. 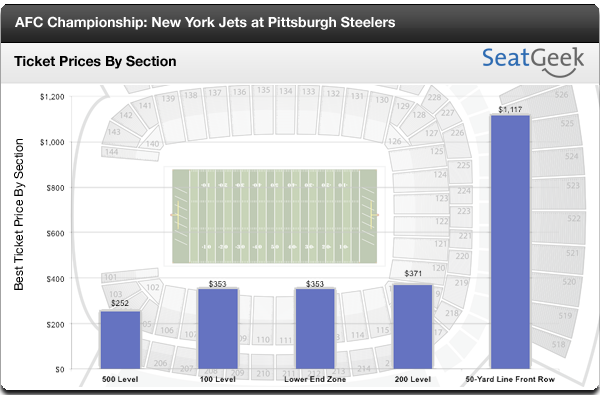 A ticket to watch the New York Jets and the Pittsburgh Steelers battle it out in the AFC Championship is definitely not cheap, listed on the secondary market for $604 on average. Although the average ticket price is a little high you can definitely find tickets for a decent price. Be sure to get your AFC Championship tickets today on SeatGeek.com.